Anne-Cathrine Herdorf was born on July 10, 1967. 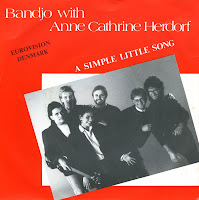 She represented Denmark during the 1987 Eurovision Song Contest with the group Bandjo, performing 'En lillle melodi'. The song finished in fifth place in a field of 22 contestants. This single features the English version of the song, 'A simple little song', plus the instrumental version. Surprisingly, this single was made in the Netherlands.